It’s always fun to see what Mathews comes out with each year. You always wonder what they are going to bring to the table. Archers commonly ask, “ The bows are so great now, what more can they do?” That’s where the VERTIX comes in! Mathews has once again revolutionized compound bows with their introduction of Switchweight technology! The VERTIX features a versatile new draw weight technology like nothing we’ve ever seen before. The Switchweight modules allow peak weights of 60, 65, 70, or 75 pounds, just by changing modules on the cams. No longer is it necessary to buy different limbs to change the max draw weight on the bow. Talk about versatile! If you’re a one bow kind of archer, you can use the same bow to shoot target archery at a lower poundage, or to hunt with at a higher draw weight by simply changing mods! If you plan on passing the bow on to a family member who shoots lower (or higher) poundage, you can do so by simply changing mods! That’s not all. This bow’s not too short, not too long 30” axle to axle, makes it very versatile for both the target archer and hunter. It features a 6” brace height, for speed and forgiveness. The vibration reducing technology has taken another step forward, resulting in one of the quietest most shock free bows ever. The VERTIX offers a shocking 20% reduction in vibration over the Triax. The new “Engage” grip is wonderfully shaped for a comfortable, torque reducing, effortless bow hold, that contributes to the bow’s forgiveness. The VERTIX bow, Arrow Web HD quiver, and Flatline stabilizers are available in Black, Stone, Realtree Edge, Ridge Reaper Barren, Ridge Reaper Forest, Optifade Sub Alpine, and Optifade Elevated II finishes. New for this year is the Ultrarest Integrate MX arrow rest. Mathews teamed up with Quality Archery Design (QAD) to introduce a micro-adjust QAD MX rest that dovetail mounts directly to the riser. This provides a secure, light, adjustable, reliable, drop away rest specifically designed for Mathews. 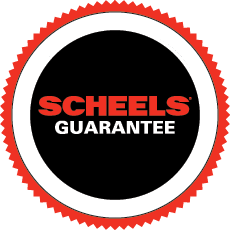 Stop into your nearest SCHEELS Mathews archery shop and try one for yourself!